… and the Israelites said unto Moses and Aaron … had we died by the hand of Lord in the land of Egypt … instead have you brought us in this desert to have all this multitude dying by of starvation. Tomorrow morning you will see the Glory of the Lord; because he has heard your murmurings against Him … Now in the evening the quails came up and covered the camp (Exodus 16.11.13.). It is known the chapter of the Bible that narrates the arrival of the flocks of quails that nourished the Israelites upon the second month of their long wandering in the desert. They asked God to send them meat and bread and quails and manna did rain from the sky. The imagination has always overcome the need to give an explanation to this so-called biblical miracle but with the present knowledges it is fairly easy to give a reason to this occurrence. Still today along the northern or southern Mediterranean coasts depending on the migration seasons, we see the invasion of these birds. Indeed, more than ever entire populations that live on the coasts of North Africa enjoy of this benefit offered by the nature and exploit in large handfuls, and perhaps without limit, so much abundance. The massacre of the quails in North Africa is deadly and would appear as one of the most dangerous and worrisome problems on the survival of this species if it were not for its great fertility and reproductive capacity. 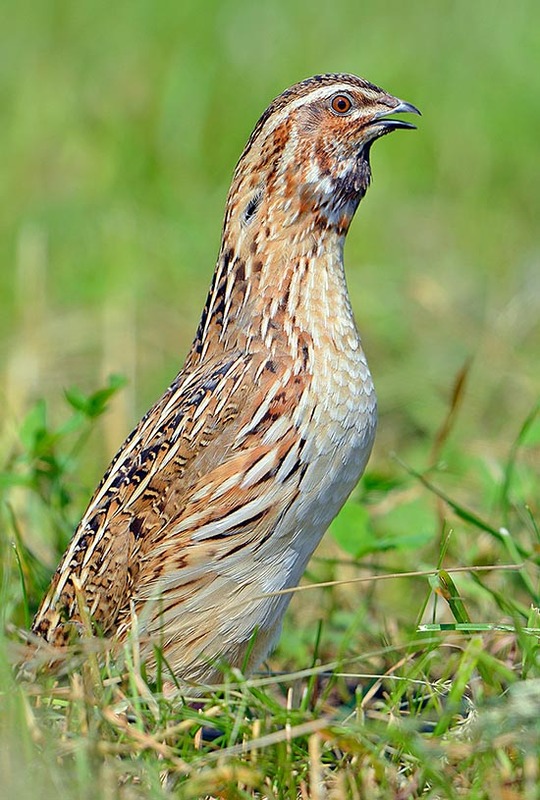 Despite being a huntable species in Europe, the time limitations set by strict hunting rules, have allowed the quails to escape the hunt during these delicate migration periods. Now they can arrive or depart from our coasts during the periods of hunting quietness and recover from the long effort. Unfortunately, beyond the waters remains the hazard announced by the Bible. The common quail (Coturnix coturnix Linnaeus, 1758) belongs to the order of the Galliformes and to the family of the Phasianidae and is since always famous for its delicious meat. It is said that Jane Seymour, queen of England, third wife of Henry VIII, while pregnant, had an insatiable desire for quails whereby the whole court was mobilized for replenishing the court larder. Shame that once the desires satisfied and the son born, the queen passed away soon due to the consequences of a terrible three-days long labour and consequent puerperal fevers. But here the quails are not involved! It is likely that the strong availability of this meat in certain periods of the year, for all the populations benefitted by such grace, has led this bird to be well appreciated on every table besides entering the culinary tradition of the various regions involved. As we shall see, the quails are strong migrants and during these movements they gather on the coasts of the seas before leaving for the tiring crossing. The quail is not a good flyer, having like all galliforms, a massive body if compared to the wings that are short and squat. For this type of bird, flying over long distances is a rather difficult operation, often fatal if the weather conditions are adverse. The arrival on the coasts is exciting and gives the idea to what effort is subjected this small bird. The flock arrives flying low on the surface, swaying like the waves of the same sea, with descendings and ascendings of the wave motion as if they were small hills to overcome and when on the land, throw themselves rolling on the ground, exhausted, and often are not even able to stand on their legs. A few moments of bewilderment, then drag themselves where possible, under the first available shrubs or even the smallest and rarest tufts of grass on the beaches. It is said that it is easy to catch them with the hands, as they are so exhausted by this immense effort. Only after a few days they resume flying to disperse towards their final destinations. The goodness of this bird is not limited to the only meat but also to the eggs. The quail is a very strong layer and this characteristic, well known by the man, has always been exploited for an overproduction to which this bird appears to be prone. 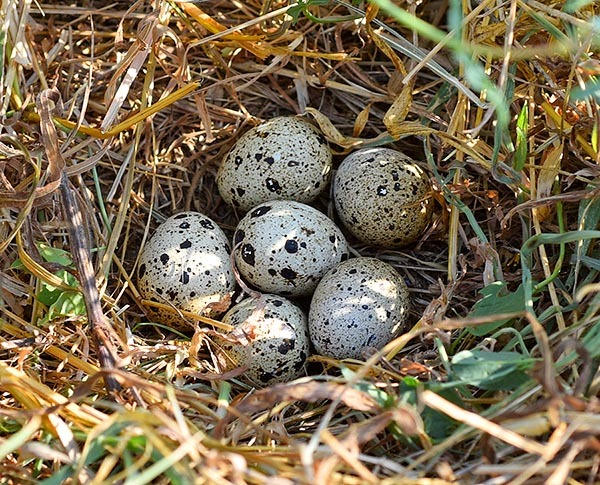 In the East, the eggs of quail are since always a common food and now also in the western world they are becoming a habitual food. The quail, like the common hens, induced to the re-deposition with the continuous taking of the hatching, becomes a ceaseless layer. The scientific name Coturnix, comes from the eponymous Latin term “coturnix-coturnicis” that simply means quail. Some common European names: Wachtel in German, Caille des blés in French, Codorniz común in Spanish as well as in Portuguese, Quaglia in Italian and Quail in English. 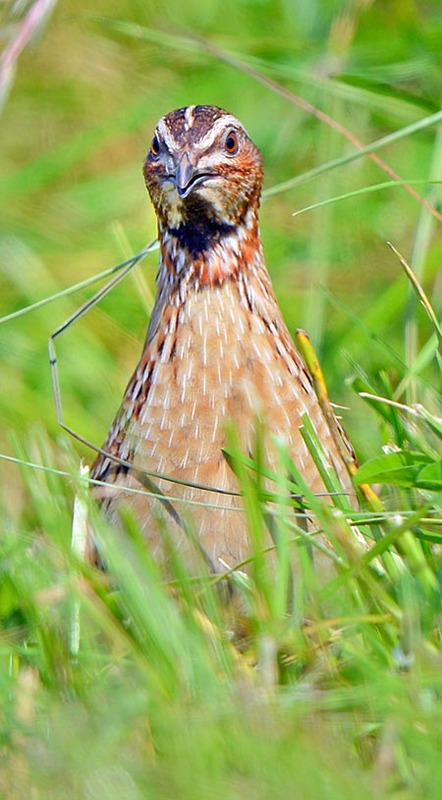 The quail lives in all European regions excluding the extreme north and the mountaintops. In Asia is also common in the whole central area with the taiga as northern limit and on the south the tropical forests. The creation of industrial farms for the alimentary production and the hybridization with the conspecific Coturnix japonica of slightly larger size, has broadened the presence of this bird, now hybrid species, in all the continents. All the central Asian plains are densely populated by this bird and in many of them they use to catch it and breed it in a cage for food usage. In Uzbekistan is also a popular tradition to keep it in cage as company bird. In the country villages of the Fergana Valley, the most cultivated and most prosperous area of central Asia, in the first hours of the morning and at dusk, timings dedicated to singing for this bird, is a usual music. Every house, every family, every orchard has its cage with the quail. All European quails and part of the Asian ones migrate in Africa dispersing in all sub-Saharan area going southwards in particular in the eastern savannahs. The rest of the Asian populations winters, on the contrary, in the Indian subcontinent. For the quails there is not a precise and contextual date for starting this long journey. Some populations move since July, others begin in August and so on till November. All start individually southward till when they reach the coasts of a sea or of a big internal lake such as the Caspian Sea and here they stop and accumulate in an impressive number, until when they find the courage to start the hard crossing. Africa besides hosting the migrant population of Asia and Europe, has several subspecies that occupy stably some specific areas. The typical African race Coturnix coturnix africana, the Abyssinian Coturnix coturnix erlangeri, that of Cape Verde Coturnix coturnix inopinata and the Azores one, the Coturnix coturnix conturbans. 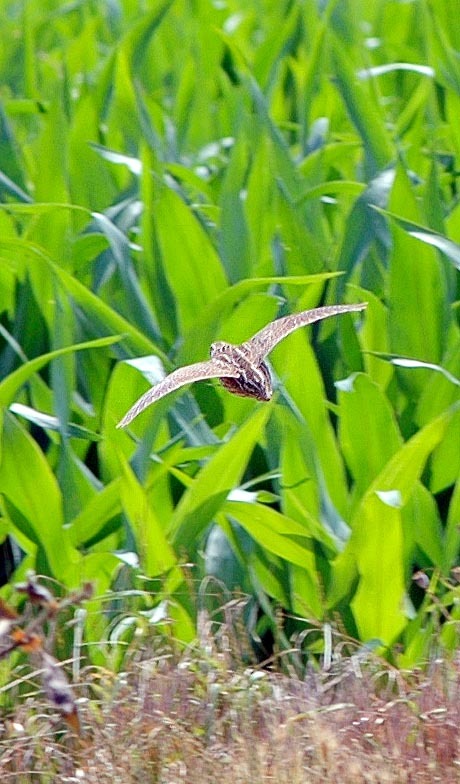 The quail loves the fertile areas, highly cultivated with cereals and rich of grassy or steppelike meadows where nidify. It avoids any area having marshes or swampy lands, woods and strongly wooded zones and high mountains even if in Asia it is found up to 3000 m of altitude. In Europe it may rarely reach the 2000 m, always on vast grassy sunny prairies and with no tree cover. Preferring fairly dry habitats, it does not rely on the water for its personal care but on the dust with which it takes frequent baths, showingly dusting itself whenever it gets the chance. The quail does not have the slender and elegant look that usually do have all birds. Its body is clumsy, disproportionate to its size, the tail is almost missing and leaning toward the ground, short neck with the head kept snuggled between the shoulders short and very robust legs. A hen of reduced dimensions. It is a strong walker that prefers to run on the ground instead of taking off and when it does so, obliged or menaced too closely, flies off noisily emitting that dry and strong fluttering produced by the very rapid flapping of the wings. The massive body requires a considerable effort for taking off and the wings must necessarily flap in a very noisy way in order to be able to express the thrust necessary for flying off. The reluctance to flying away shown by this bird is legendary, in particular for the hunters who traditionally use the pointing dogs. It is often said that the dog can bite it on the ground, so much it can get close to it. The quail measures about 23 cm of length, a wingspan of about 35 cm and a weight having a very strong seasonal variability that may double from the usual 70 up to 140 g.
The colour of the livery is mainly formed by a series of light brown streaks speckled by black and white lines. On the back the colour is stronger and presents also black spots and lines, spaced by small cream stripes. The chest, paler, is totally of cream colour crossed by black vertical lines going down to the underwing. The male on the neck has a more or less marked rusty brown spot, which is instead absent in the female. This last has slightly paler colours though maintaining the same livery as the male. The quail nourishes of grains of any kind, buds but also of larvae of ants and many other arthropods it looks for on the ground scratching about with the typical attitude of our hens. It often gulps also very small stones to facilitate the crushing of the swallowed seeds. It often loves, after having rummaged with its strong legs in an anthill looking for larvae, to perch over it opening wide the wings and ruffling the feathers so that the ants can wrap it completely. This habit, however observed also in other species, is one of the most natural ways for getting rid of possible parasites, in fact the ants for defense spray formic acid on the feathers of the host covering them with an excellent disinfectant. The call of the quail is a sound typical of our countries, known by many and repeated also in the musical literature by great musicians. A sound that is integrant part of warm summers that fully merges with the blazing sun and the chirping of the cicadas. 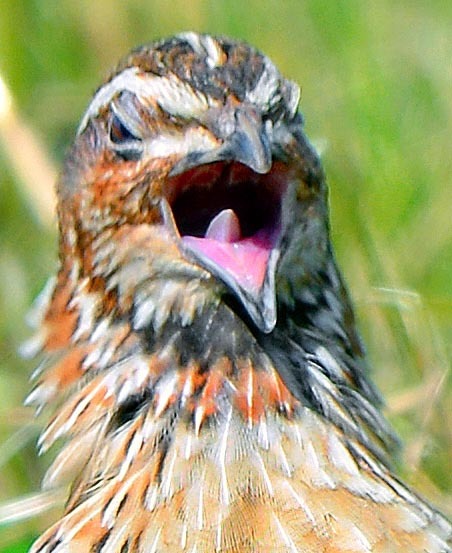 The British, who by ancient tradition use to “humanize” the songs of the animals combining them to highly effective onomatopoeic phrases, have translated the quail’s song in “wet my lips”. Three simple words that, repeated, perfectly imitate its song. If this song emitted by the males is well known by everybody, it is quite difficult to hear and distinguish that of the females, being this much more discreet and often mistaken with the songs of the crickets and grasshoppers. The mating happens after some time from the arrival from the migrations and the nidification begins only with the approaching of summer. The female, chosen the territory, usually a meadow or a cultivation of wheat or barley, digs a slight depression into the soil covering it with few dry and soft grasses and lays there 6 to 12 eggs of cream colour widely spotted with reddish ochre dots. At that time refuses the presence of the male who then can begin a collateral life with other females. This consensual dismissal between the sexes seems to originate forms of polygamy in the males but also of polyandry in the females. The brooding done only by the female lasts about 18 days and by the hatching the chicks come to life covered by a slight down that allows them to abandon the nest almost immediately. The female follows the brood for two weeks till when the chicks, very precocious, are able to fly and to get away. Usually it does one brooding but often a second one occurs after the departure of the chicks. Many ornithologists support that the migrating quails nidify also in the African winter quarters. Indeed, many individuals seized on the spring arrival on the European coasts, clearly show the ventral plaque typical of the birds who have recently brooded. This would not be so much surprising seen the great prolificity of this bird. From some estimates, it would result that the world population of wild quails may reach the unbelievable number of 300 million of individuals qualifying them as one of the most common birds in the winged world. The quail has shown during the last decades significant reductions in the number, mainly due to the changing of the farming methods and of the typology of the crops.